America's schools are in a state of crisis. By the end of the day, 7,000 students will have dropped out of high school, or just over 1 million every year. Meanwhile, 40 percent of teachers will leave the profession within five years, resulting in an increasingly dire shortage of qualified instructors. While state and federal policymakers often focus on testing and accountability, University of Delaware associate professor Deborah Bieler suggests that keeping students and teachers alike from dropping out of school may be as simple as engaging in meaningful conversation. 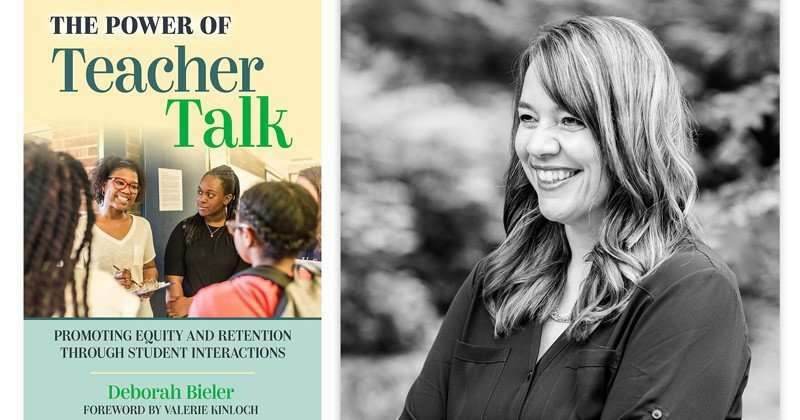 In her new book The Power of Teacher Talk: Promoting Equity and Retention Through Student Interactions, published Nov. 9 by Teachers College Press, Bieler asserts that brief daily interactions shouldn't be thought of as meaningless small talk. Just a few words of encouragement, a genuine compliment and even a follow-up from a previous conversation shows students they are valued, which in turn allows teachers to experience greater job satisfaction. "Teachers typically engage in five student interactions per minute—that's one interaction every 12 seconds. Each one shapes and reflects participants' attitudes about staying in school," said Bieler, who is also a former high school English teacher. "The great potential of these interactions to change lives for the better is often why students love school, why people become teachers, and why both students and teachers stay in school." Meaningful interactions, however brief, are especially important for teachers and students of historically marginalized groups. "Equity-oriented teachers look for and take opportunities to actively promote and increase equity wherever they can," said Bieler. As a result, "When students and teachers remain in school, there is a greater chance that they can use their more deeply developed skills and knowledge to create a more equitable world for themselves and for others." So what can teachers do and say to keep marginalized students from "falling through the cracks"? In her book, Bieler outlines four strategies. Classroom décor makes a visual statement of a teacher's stance on equity, social justice and commitment to staying in school, so Bieler suggests including "pivotal items" such as posters or bulletin boards that acknowledge and support social justice, instead of school-focused messages, to show students they are welcomed and valued. "One teacher displayed an inspirational poster entitled 'Determination/Little Rock Nine,' which included images of the Little Rock Nine students who integrated Central High School in 1957," said Bieler. Every day, teachers and students engage in hundreds of spontaneous interactions that have a profound effect on each group's decision to stay in school. So, Bieler suggests, respond with patience rather than discipline. "Teachers are uniquely positioned to mark youth as worthy, and they do this important work through their daily interactions with students," said Bieler. Engage in unstructured small talk before and after class, unrelated to school topics. This positive energy can build a more humane connection and make students feel more valued. "The moments before and after class provide places for teachers and students to assert their agency and to create or perform their identities in ways that are not possible during class time," said Bieler. When a student is in danger of "falling through the cracks," as Bieler puts it, invite the student to stay and talk after class. "Compared with all of the other interactions discussed in this book, these intentional staying-to-talk interactions with students were among the most powerful ways that I saw equity-oriented teachers try to connect with students about whose success they were concerned," said Bieler. "The meetings communicate that the teacher is paying attention to, or investing in, students and signal to students their value and sense of promise." Reviewers have described the book as "an indispensable resource for new and practicing teachers alike" and "a must-read for anyone interested in understanding and improving life in schools." Charles Sanders Peirce cautioned in 1858 young men too impressed with their imitation of a pig's squeal. (Page 101, Harvard Magazine Volume IV, April 1858.). It is still a word to the wise. A smart man knows the right answer when he hears it. Want to keep teachers? LET THEM TEACH! Instead of that we have teachers trying to do the jobs of the parents, social services, secretaries, police, etc... They didn't sign on for that crap. Also have the principles actually do their jobs and stand up for their teachers when idiot parents start whining why their low IQ kid who is far more interested in playing with their phone or calling other kids 'uncle toms' during class that do study isn't passing their grades. The average grade school teacher works about 80 hours a week and during summer has to go to continuing education classes the entire summer. I know because both my wife and I have both been teachers. Her 14 years and me 5. You can't do the job you were hired to do anymore. You are expected to do the jobs of at least half a dozen people now instead of simply teaching the students. The fact that you get your job threatened due to some students who fail because they can't even speak the language doesn't help either! Among other things, it's not obvious how 7000 students dropping out every day amounts to "just over 1 million every year". It can be said that teachers don't appreciate being required to supply all familial instruction, at no increase in pay. And, for many who became teachers, if they were shown interest by any other company, it is likely they would have gone to it and not become teachers. They would remember classmates mistreating their own teachers and would decide it's not promising. Corporate advertised jobs usually are awarded by intercession of acquaintances, which many who become teachers don't have. And "training the leaders or tomorrow" isn't necessarily more than pitch man doggerel. As for students dropping out, do they have their parents' permission? How do they explain what they do all day? And it should be examined how many students believe they're going to be completely supported their entire lives.